Ενα γρήγορο post για να γνωρίσετε μία νέα και πολλά υποσχόμενη blogger!!! Διάλεξα ένα post της που μου άρεσε ιδιαίτερα..και έκανε και η Νατάσσα το ίδιο!! Για να το δούμε λοιπόν!!! Mascara is the one make up item that we all need on a daily bases , you can make your eyes look bigger, more awake , brighter and all that with a couple coats of mascara . But let's be honest we have try million mascaras that didn't worth the money. Well I'm going to review some mascaras and tell you which one is my favorite !!! 1) MAC Haute & Naughty Lash Mascara : I bought this one for 25€ i think , anyway it wasn't cheap but i wanted to try one mascara from mac. First impressions, amazing i really like it because it came with two steps the first one is more appropriate for a day time look , gives length - volume and separates amazingly the lashes.The second step is more appropriate for the night time adds a serious amount of volume and makes my lashes really really black .Overall i think that this mascara is amazing but it has one downside it can't hold a curl well i found that after a couple of hours the mascara is not how i first apply it but it still looks really nice. 2) Maybelline Volum' Express The Colossal : Really nice mascara cheap and easy to apply.Comes with a big brush for a lot of volume.I like this mascara for a more natural look ,definitely gives volume and i found that make my eyes appear bigger.I will buy it again ,because it is cheap and awesome for everyday.If you are looking for something more dramatic and intense this is not for you. 3) Maybelline The Falsies in Black Drama : I can't say enough good things about this mascara , maybe the best mascara i have ever tried. Really cute packaging , cheap , i like the spoon brush and it is easy to apply.I have the black drama version if you have try the flared one let me what you think.Gives to your lashes a curl , makes them look bigger and volumized and gives a flirty look. I have to give to this mascara 10/10 and i will buy it again and again! 4) Care Mascara : Don't get this mascara it is awful it didn't make anything for my lashes i don't know why. I didn't buy it myself they gave it to me but it's not worth it. 5) Oriflame Beauty Endless Lash Mascara : Nice for length , i used to combine it with a voluming mascara or wear it alone for a more natural look .I like the packaging and it was cheap , around 8 € i think.It doesn't clump and i found that it separates my lashes really well . 6) Seventeen X-traordinaire Mascara : If you live in Greece you might have already recognize this mascara.I like the packaging , the brush reminds my of max factor's false lash effect mascara , cheap 10 € and adds volume,length and separates the lashes .One of my top favorites mascaras i will buy it again , it's to bad you can't get it outside form Greece but if you haven't try it you should . The effect you get is really stunning it doesn't flake, smudge or transfer one bit. 7) Maybelline Volum' Express Lift-Up : The first mascara I've ever tried really similar to "maybelline falsies " again the formula , the spoon brush reminds me of this mascara but i think that the falsies one is quite better because it's more black and adds volume. The lift-up mascara gives curl and length and doesn't clump.If i have to choose between the falsies and this i would choose the falsies. 8) Oriflame Beauty 2FX Mascara : This is similar to " mac haute & naughty lash" , comes with two steps and adds volume and length , it might clump a bit and doesn't separate the lashes well . 9) Maybelline Volum' Express One by One : Maybelline you let me down with this mascara. I didn't like it at all . The formula is too wet , it's difficult to apply , it smudge , it flakes and it is clumpy. I have big lashes and this mascara left gaps between my lashes.I would advise never to use this product. I will not be purchasing this again. 10) ARTDECO Perfect Definition Mascara : The combination of growth boosting eyelash care and deep black mascara. The effect that this mascara gives it not that awesome but it makes my lashes black adds length to them and makes them look fuller.I like to combine this mascara with a voluming one.As for the growth part ,yes i found that it made my lashes grow. 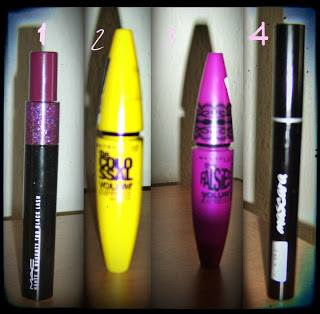 What is your favorite mascaras? Any recommendations ? " Επισκεφθείτε το blog της!!!!!!!! !Είναι πολύυυυ πολύ καλό!! xixixi ναι! !ιδέα της Νατάσσας ήταν!Είναι νέα στην παρέα μας!! Φιλιά πολλά και στις δυο σας!!! Ωραία ιδέα! Και το post της Νατάσσας πολύ καλό!!! Ωραίο ποστ και ωραία ιδέα! Γιατί έτσι πρέπει να βοηθάμε η μια την άλλη!!!! Όσο για τις μάσκαρες ω ναι η αγαπημένη μου είναι η πρώτη MAC FTW!!!! Ακριβώς! !η Νατάσσα είναι νέα στην παρέα και χρειάζεται ένα μικρό σπρώξιμο!!! Δυστυχώς δεν την έχω δοκιμάσει! !Το ποστ είναι της Νατάσσας!!! Εχω στο τέλος του ποστ το link της!! :) :) Δυστυχώς δεν έχω δοκιμάσει καμία!!!!!!!!! Από όλες αυτές έχω δοκιμάσει μόνο τη 2 και την 3 και είμαι φαν! Αγαπω Maybelline NY! !